To view this gallery of photos ranging from my childhood to now, click on each image (or use the half-arrows to go back and forth). Dorcas Demasio, her five children and her niece (far right) after the matriarch overcame enormous odds to obtain a graduate degree from Columbia University in 1977. Queen Dorcas, also an alumna of New York University, ended up with three degrees. During the 1980s, I wore outfits made of kente cloth either for fun or for special occasions. I didn't make it a habit considering the constant Africa-related jokes I had to tolerate while growing up in West Harlem. 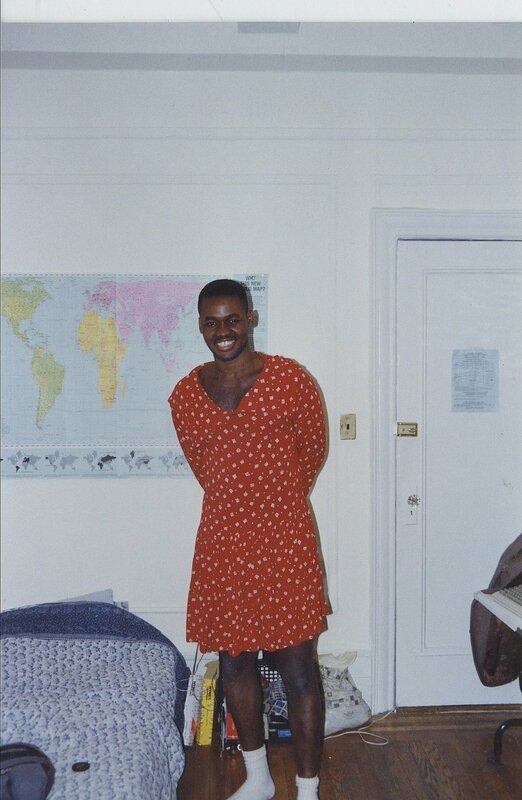 A girl I once dated convinced me me to try on her dress while I was staying over at her apartment. I never repeated the act. Mom seems more excited than I am at my St. John's graduation. The building that I grew up in was on 121st between Amsterdam and Broadway. In this photo circa 1990, I'm sandwiched by Rhahime Bell and my youngest brother, Nana, who would die after the 1995 earthquake in Kobe, Japan. During the early 1990s, I was in a long-distance relationship with a young woman (center) who lived in Austin, Texas. She took me to see her sister's family -- and their goat. I'm glad I got back alive! The block of 121st ST between Amsterdam and Broadway or simple "121" -- as we called the epicenter of our neighborhood in West Harlem -- comprised an eclectic group of kids who mostly hung out together. Before I left for Seattle in the summer of 1997, my family gave me a send-off. The bash, marking my departure from New York City, occurred at the storied Riverside Church, located just up the street from most of us. I'm checking out my to-do list at my home office in Seattle, where I lived from 1997 to 2002. This photo is from a modeling shoot in Seattle. The owner of the company had crossed paths with me at a local Starbucks, and urged me to model part-time. I was initially skeptical of the request, and had assumed that he was a gay dude trying to pick me up. During my five-year stretch in Seattle, my mom visited annually. My neighborhood of Lower Queen Anne -- future Raptors coach Dwane Casey lived on the same block as me -- offered some scenic views. This is the last-to-leave group at my going-away party in Seattle. After a five-year stint, the Washington Post lured me away in 2002. When Sports Illustrated hired me during the fall of 2005, I moved from Seattle to 74 West 68th ST, between Columbus and Central Park West. I would reside there from 2005 to 2011 before temporarily moving to White Plains, New York. Here's my home office at 74 West 68th ST.
My mom and I maintained our tradition of occasionally vacationing together to make up for living in different cities. While residing in Washington, DC, I took her to the Atlantis Resort in the Bahamas, where we checked out its well-known aquarium. Cheers! My favorite vacation spot was in Maui, where my mom and I stayed multiple times at a lovely resort. MIAMI, 2007: Super agent Leigh Steinberg -- whose life was the basis of "Jerry Maguire" -- threw his annual Super Bowl. My invitation allowed me to bring pal, Doug, and his future wife, Roxie. It was cool to meet actress Gabrielle Union at Leigh Steinberg's Super Bowl party. I was tempted to ask for her cell number. 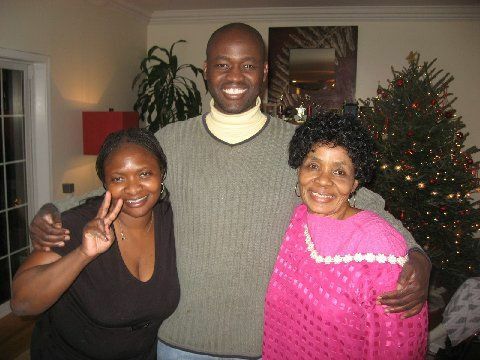 Xmas '08 with two of the most inspiring women I know: my cousin, Dr. Kafui Demasio (rated one of NY's top obstetrician) and my mom, going strong as a septuagenarian (after single-handedly putting five kids through college). 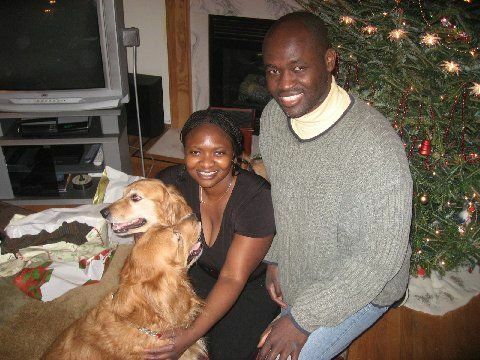 Christmas '08: My cousin, Dr. Kafui Demasio, and her rambunctious Golden Retrievers: Odysseus and Cecelia. During my Parcells project spanning six years, I gathered material in more than 100 notebooks. On July 4, 2009, I give my aunt, Phoebe, a birthday gift as her sister -- my mom -- smiles approvingly. The get-together occurs at North White Plains, New York, where Auntie Phoebe lives with her daughter, Dr. Kafui Demasio. I'm with my second cousin, Ezekiel Nana Demasio -- Kafui's only child -- in front of their home. His middle name came in honor of my late brother. I'm relaxing with the one and only Alexa Roubachewsky at our favorite spot in Central Park: the benches abutting Sheep Meadow. Relaxing at the Columbus-Circle Fountain. 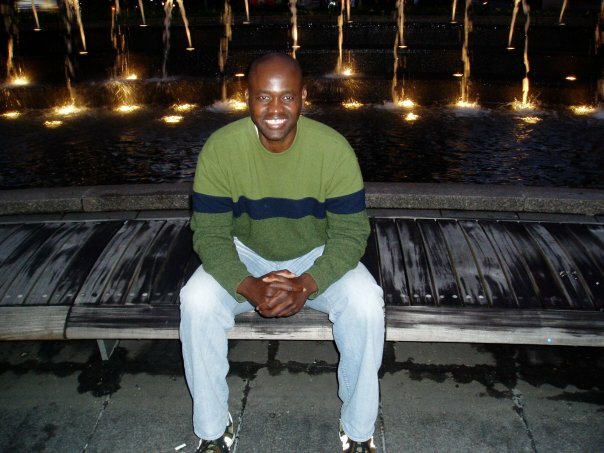 LOS ANGELES, November, 17, 2009: I catch up with my friend, Tanya Young, a talented television writer who I first met in my old neighborhood where she attended Columbia University. LAS VEGAS, November 20, 2009: What are the odds that I would run into the bridegroom, Doug Lo, at Caesar's Palace the night before the big day. After the vows at Vegas's Bellagio Hotel on November 21, 2009, I steal a moment with the newlyweds, Doug and Roxie Lo. 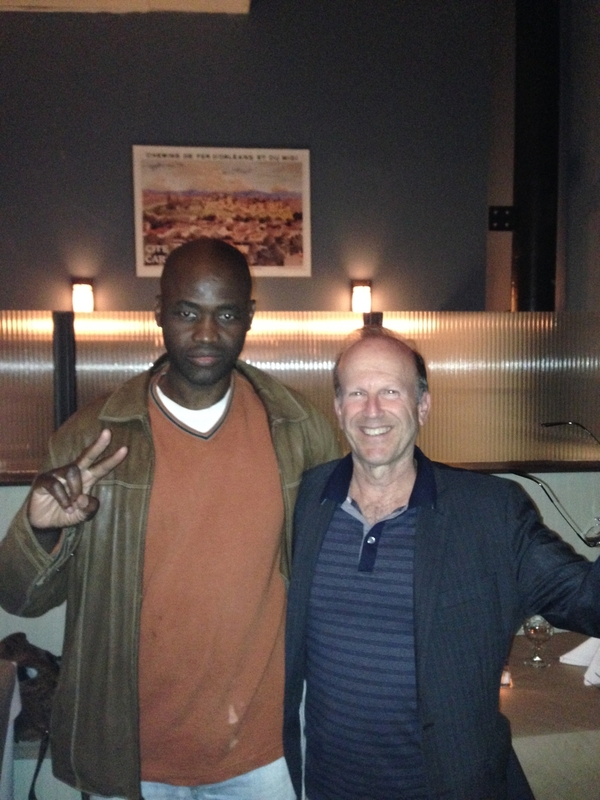 I'm with Time Inc honcho, John Huey, after we ate sushi in my neighborhood circa November 2010. 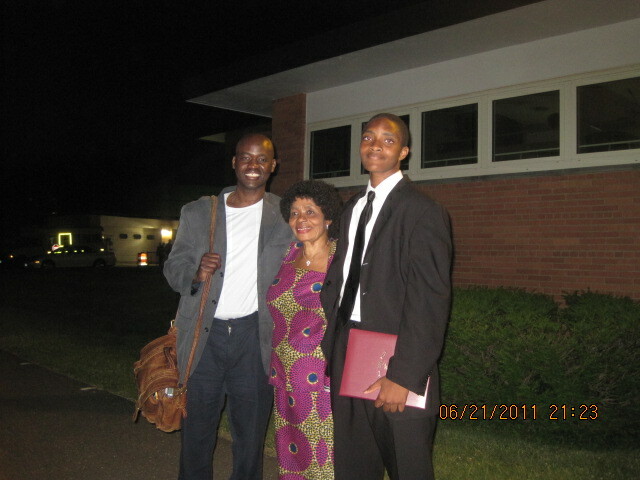 Queen Dorcas is sandwiched between me and Zeke after his junior high school graduation on June 21, 2011 in Valhalla, New York. After biking through Central Park, Alexa and I decide to take a break. My mom and I sharing a moment with the bridegroom, Bobby Buckley, at the wedding reception in New York's Four Seasons Hotel on October 22, 2011. My mom helped raised the bride, Milano, in West Harlem. 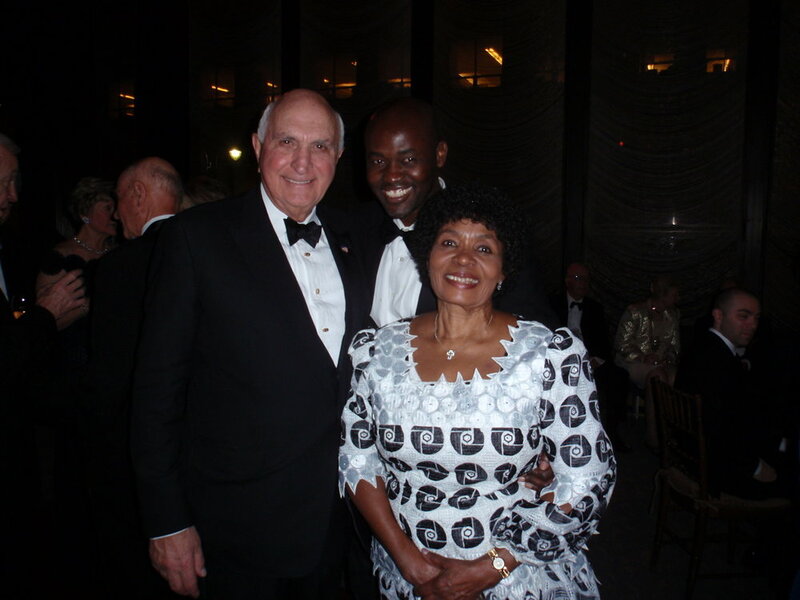 At the wedding reception, I introduced my mom to Ken Langone, the down-to-earth billionaire who co-founded Home Depot. I'm having a man-to-dog conversation in September of 2011 with my favorite Golden Retriever, Odie. From 2011 to 2014, while working on my first book, I lived in my cousin, Kafui's lovely home. Me and my publishing lawyer, Eric Rayman, before eating at a French restaurant in Greenwich Village during the summer of 2014: We celebrate the completion of my contractual obligations for my first book. WEST HOLLYWOOD, CA, April 5, 2015 -- I'm sitting at an Italian restaurant near Beverly Hill's Rodeo Drive during a trip to visit my friend, Fame Cohen. June 9, 2016: It was neat to be a guest of Norman Pearlstine's -- the influential editor -- at a gala honoring him at Cipriani 42nd ST. Norm introduced me to legendary writer Gay Talese, who sat at our table, leading to this cool note. Alas, no more room on my bookshelf. My quirky slippers -- and mindset. Ha! Queen Dorcas in front of my book shelf during summer 2017.